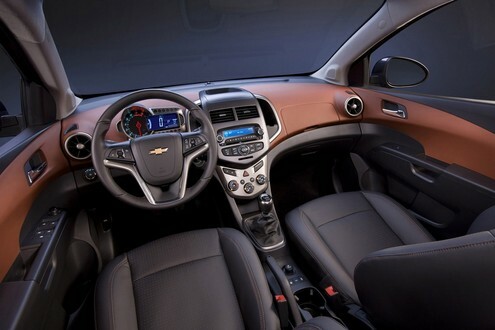 The new generation of Chevrolet Aveo is a whole new model. It doesn’t share a single thing with the old one, not even the name! 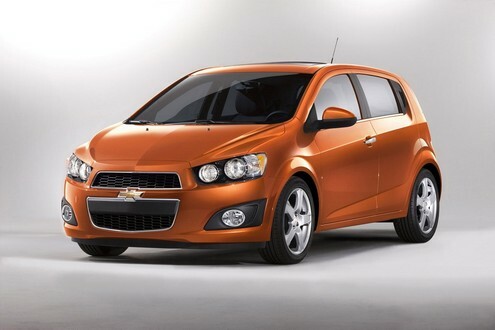 Officially unveiled at NAIAS, it is now called the Chevrolet Sonic and will become available as hatchback and sedan. The best feature of the new car is the cool and funky design. The Sonic is the only small car built in USA and will be assembled at the General Motors Orion plant in Michigan, which received a $545-million investment in upgrades and retooling. The 2012 Chevrolet Sonic will be powered by the same powertrains Chevy Cruze is using with great success, including the Ecotec 1.4L turbo and the Ecotec 1.8L. The Ecotec 1.4L turbo’s power ratings are estimated at 138 horsepower (103 kW) and 148 lb.-ft. of torque (200 Nm) between 1,850 rpm and 4,900 rpm. The 1.8 L engine is estimated at 135 horsepower (101 kW), along with 123 lb.-ft. of torque (167 Nm) at 3,800 rpm. Three transmissions are available: a five-speed manual and six-speed automatic with the 1.8L and a six-speed manual with the 1.4L turbo. The exciting design of the car in both hatch and sedan models is very nice, but better than is the motorcycle-inspired interior with a large, round analog tachometer set within an asymmetrical LCD readout, with a large digital speedometer display. The mid-instrument panel surface is available in two colors (dark titanium and brick) and flows seamlessly into the upper doors, with premium low-glass finishes. Other cool touches include the “cobra head” design for automatic gear ****, manual shifter has a chrome-finished ****, and tubular outboard climate outlets.